The ASX Group's origins as a national exchange go back to 1987. The Australian Stock Exchange Limited was formed in 1987 after the Australian Parliament drafted legislation that enabled the amalgamation of six independent state-based stock exchanges. Each of those exchanges brought with it a history of share trading dating back to the 19th century. The story of ASX is long and eventful, full of world-firsts and new technologies, and underpinned by a determination to find better ways to service the market and strenghten investor confidence. The first corporate venture in New South Wales, 29 years after the colony’s European founding, was The Bank of New South Wales (now known as the ASX-listed company Westpac) in 1817. In Victoria, the gold-rush of the 1850s resulted in the formation of stock exchanges in at least three cities: Melbourne, Ballarat and Bendigo. Early exchanges included Khull's Stock Exchange, the Victorian Stock Exchange and the St Kilda Stock Exchange. In 1860, there were no less than 10 specialist brokerages in Melbourne and they joined together to publish The Stock and Share Journal. In April 1861, they formed the Brokers' Association and went on to publish 63 rules outlining the procedures for admission to the Stock Exchange of Melbourne. All of these exchanges were short-lived. In May 1871, the Sydney Stock Exchange was formed (depicted below) and continued operating until it merged with the other five state-based exchanges to form the Australian Stock Exchange on 1 April 1987. First official call of the newly formed Hobart Stock Exchange. The Brisbane Stock Exchange is established on 23 July, a set of rules were drawn up and the first call was conducted. The Stock Exchange of Melbourne was formed by a small number of sharebrokers, 16 October, after a number of attempts to form a lasting stock exchange over the previous 32 years. Two years after the private Broken Hill Mining Company was established by a syndicate of seven men from the Mt Gipps sheep station, it incorporated to become The Broken Hill Proprietary Company Limited (BHP). In 1885, BHP listed on (the now) ASX. First meeting of the Stock Exchange of Adelaide held 3 October. Official opening of the new Adelaide Stock Exchange building. 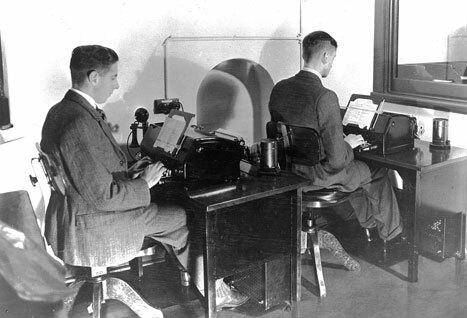 The gentlemen operating the teleprinters are Ralph Hauser (left) and C. Rodney Eggleston who both later became members of the Melbourne Stock Exchange. The Australian Associated Stock Exchanges (AASE), the forerunner to the ASX, established. The state stock exchanges had met on an informal basis since 1903, but in 1936 Sydney took the lead by formalising the association. Initially this involved the exchanges in Adelaide, Brisbane, Hobart and Sydney. Melbourne and Perth joined soon after. Through the AASE, the exchanges gradually brought in common listing requirements for companies and uniform brokerage and other rules for stockbroking firms. They also set the ground rules for commissions and the flotation of government and semi-government loan raisings. 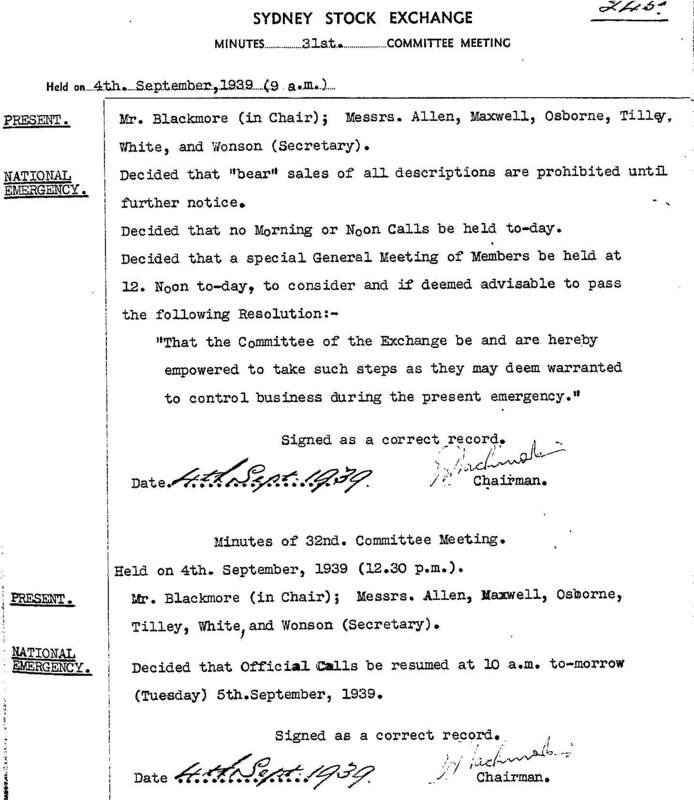 A special meeting held at the Sydney Stock Exchange on 4 September, following the outbreak of WWII. It was decided 'that "bear" sales of all descriptions are prohibited until further notice. No morning or afternoon calls be held to-day. A special general meeting of members be held at 12 noon to decide whether the Committee of the Exchange be and are hereby empowered to take such steps as they may deem warranted to control business during the present emergency'. The market, including share price movements, controlled by the Australian Government. Open-market conditions were re-introduced in 1947. The call system of trading was discarded and the post trading system adopted at the Sydney Stock Exchange. Other states followed soon after. 'Post Trading' was where brokers gathered in a certain section of the trading floor to deal in specified stocks in a more informal manner. There were 25 stocks initially traded using the new system in 5 daily sessions, ranging from 10 mins to 95 mins in their schedule duration, and totalling 3hrs and 45 mins. Sydney Futures Exchange (SFE) began trading as Sydney Greasy Wool Futures Exchange (SGWFE). Its goal was to provide Australian wool traders with hedging facilities in their own country. It changed its name to SFE in 1972. SGWFE offered a single contract of greasy wool that by the end of the year had traded 19,042 lots. The Melbourne Stock Exchange started a transfer marking service (TMS) with Sydney following soon after. This service was not compulsory for brokers to use. The AASE approves the development of an education programme for people destined to be in 'the securities industry'. This education programme become the Securities Institute of Australia (SIA) and later FINSIA, now part Kaplan Professional. 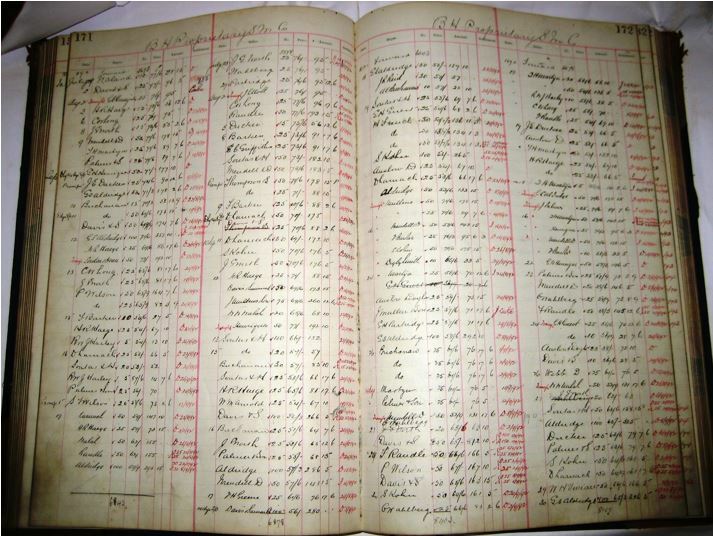 Introduction of 3 letter company codes for listed stocks. Melbourne Stock Exchange adopts post trading due to its success in Sydney. Brokers working the Melbourne trading posts with clerks taking and reporting trades from the broker booths. 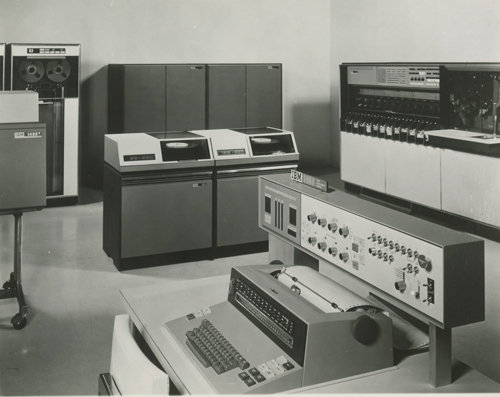 Sydney Stock Exchange installs its first computer - the IBM1460 from Canada (see below image). Delivered in seven sections, the heaviest part weighing almost three-quarters of a ton. 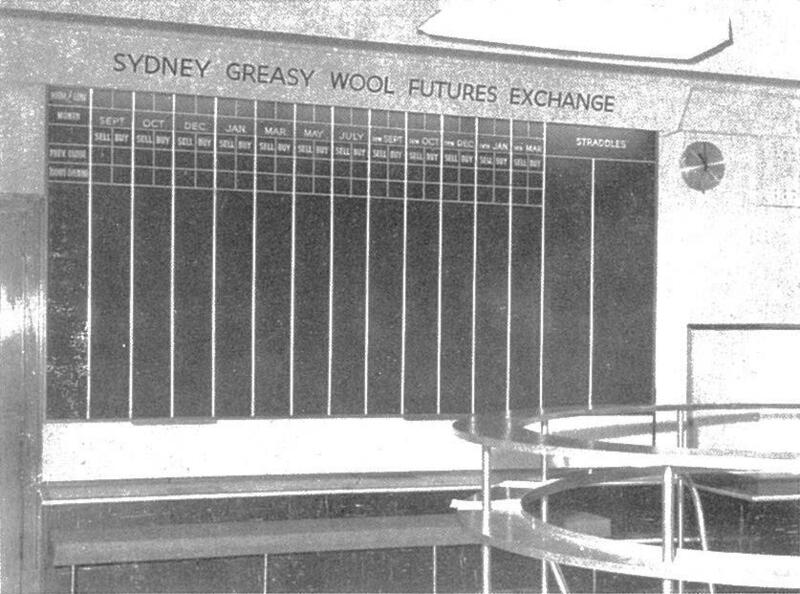 By the mid-1960s, the SGWFE had become the world’s leading wool futures market. Australia adopts decimal currency on 14 February. Chalk boards in all exchanges have to be updated to reflect the new currency, as shown below. Electronic price dissemination system - Stockmaster - introduced so stockbrokers could receive bid, offer and last prices at their desks. Stockmaster was a joint venture between Sydney Stock Exchange and Reuters. Securities Industry Act was enacted in NSW, the first legislation in Australia to cover the securities industry. The new legislation was welcomed as a means of underpinning the high standards within this vital sector. National listing on each state exchange introduced for all securities. SGWFE changed its name to Sydney Futures Exchange (SFE). The Rae Report was the result of the Senate Select Committee on Securities and Exchange. One of the recommendations was the formation of a regulatory body for the securities industry, a forerunner to ASIC. Jean Gordon (pictured below) becomes the first female member of the Sydney Stock Exchange, initially as a partner of John Sweeney & Co, then as an individual member in her own right. The Australian Options Market (AOM) was established by the Sydney Stock Exchange on 3 February 1976, providing the first marketplace outside North America for a new investment instrument - Exchange Traded Options (ETOs). ETOs over four stocks were initially traded: BHP, CSR, Western Mining Corp. Ltd and Woodside-Burmah Oil NL. 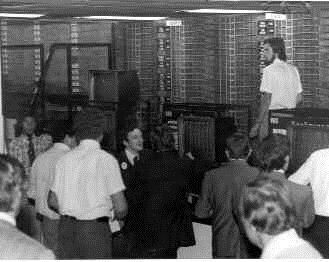 The AOM in action, Kindersley House trading floor, 1976. Mary Vernon (pictured below) won Stockbroker of the Year - a first for a woman and a demonstration of the high regard she was held in by her industry peers. Joint exchange trading begins between Sydney and Melbourne, enabling brokers to trade on interstate markets. Sharemarket Game for schools launched by Perth Stock Exchange, in cooperation with the Education Department of WA. It was originally called the Capitaliser and is now played by 70,000 students in 900 schoold across Australia. Gold futures began trading for the first time on the Sydney Futures Exchange. In another first, SFE becomes the first exchange outside the US to list a financial futures contract (90-Day Bank Bill). Market Transparenct improved with a Trans-Lux electronic display board begins streaming equity market transactions to observers in the public gallery. A joint voice line between Melbourne and Sydney Exchanges was introduced for the simultaneous transmission of price sensitive releases by member firms. It was later extended to the other state exchanges. National Companies and Securities Commission (NCSC) established - the forerunner to ASIC - replacing state organisations and ensuring a coordinated and national approach to financial market regulation. The SFE commences trading in US dollar futures, the first futures contracts in the world to incorporate cash settlement. Two Honeywell computers were installed - one in the Melbourne Stock Exchange (June) and the other in Sydney (September). Hardware enabled Melbourne and Sydney to both use Sydney's broker/broker and broker/client accounting systems. This led to the formation of JECNET (market information system). The first stock index futures product outside the US - the All Ordinaries share price index (SPI) contract - introduced by the SFE on 16 February, 45 years after the publication of the first equity market share price index. SFE introduces two-year Australian Treasury bond futures, the first bond contract outside the US. The Australian Stock Exchange Limited (ASX) was formed on 1 April 1987, through incorporation under legislation of the Australian Parliament. The formation of this national stock exchange involved the amalgamation of the six independent stock exchanges that had operated in the states' capital cities. The decision to amalgamate the six State Stock Exchanges into one national body led to the brief to create a new corporate image for the Australian Stock Exchange and yet allow for the individuality of each State body. To mark the relationship of State to national, the top half of the symbol changes colour by State but maintains the national base colour. The six vertical bars of the symbol represent the six State bodies. Launch of the Stock Exchange Automated Trading System (SEATS), 19 October. It was a far cry from the original system which dated back over 100 years. During that time there had been three different forms of trading on the Australian stock exchanges. 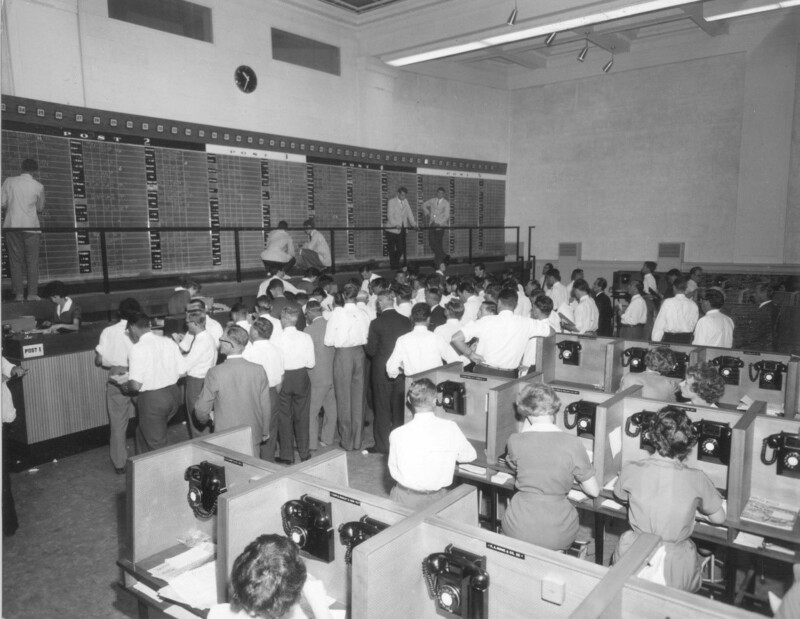 The earliest was the auction-based call system, which saw a stock exchange employee (the Caller) call the name of each listed security in turn while Members bid, offered, sold or bought the stock at each call. This system proved inadequate to handle the increased volume of trading during the mining booms. It was replaced by the 'post' system in the early 1960s, which involved stocks being quoted on ‘posts’ or ‘boards’. 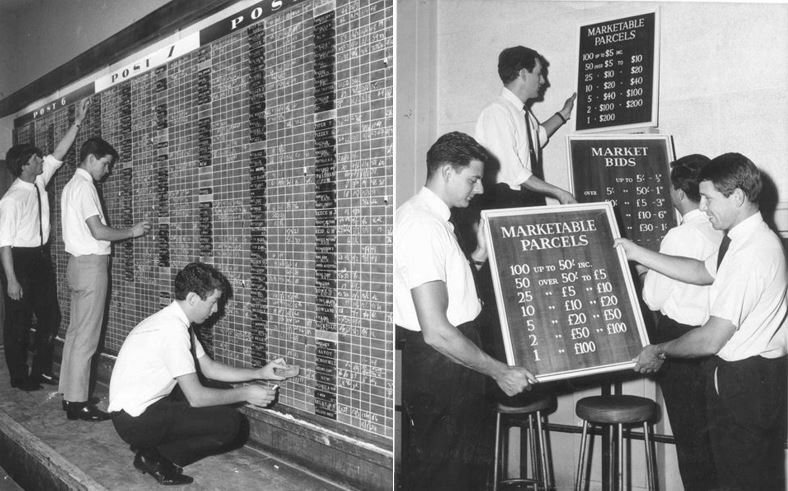 ‘Chalkies’ were employed by the Stock Exchange and it was their function to record in chalk the bids and offers of the operators (employees of stockbrokers) and the sales made. Worldwide stock market crash the day after the launch of SEATS. The system handled the order deluge without issue. 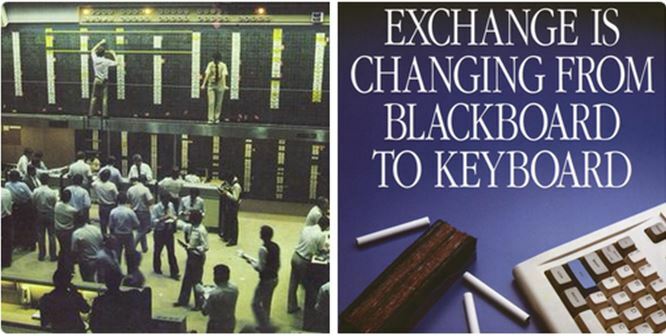 As reported in the December 1987 issue of Euromoney under the headline 'Sydney shook but never closed', the magazine commented that in a largely deregulated market and a new computerised system, the Australian exchanges continued to operate with no cut-back in trading hours. The SFE becomes the first exchange in the world to gain an exemption from Part 30 of the Commodity Exchange Act, allowing its members to market in the US without CFTC registration. Patricia Smith was a director of Day Cutten Ltd when she was admitted to membership of ASX Adelaide on August 18, 1988. SFE launches SYCOM – with this launch the SFE becomes the first futures exchange in the world to extend its normal floor trading with the introduction of an after-hours electronic trading platform. Introduction of Flexible Accelerated Security Transfer System (FAST, settlement system) by a pilot programme. The system pioneered uncertificated shareholdings, T+5 settlement and designed to do away with share certificates. Derivatives Automated Trading System (DATS) introduced to provide remote access to the market for those outside Sydney. Three years after the initial launch of SEATS, ASX trading floors closed and all stocks were converted to SEATS, forever ending the reign of the ‘chalkies’. Stage 1 of the Options Automated Trading System (OATS) commenced, replacing the existing trading floor computer facilities and automated the board brokers’ order book. First warrant lists. Sponsored by Macquarie Bank over shares in Boral. Quickly followed by the 1st index warrant issued by BT. SFE launched overnight options on futures, the world’s first product of its type. $2.45b float of Woolworths Limited. Trading was extended by 3.5 hours (7.30pm) to accommodate the high levels of trading volume. All listed companies have their securities made available to settle through FAST, only 6 companies have fully electronic registers at this stage. Flex options introduced. Allowed investors to tailor expiry month, strike price and exercise style. First stage of CHESS implemented. Conceptual development began in 1989. Seventy-five years after two young war veterans realised Australia’s vast distances offered the ideal environment for a fledgling aerial service, Qantas shares were listed and traded for the first time on the ASX. Completion of implementation of CHESS Phase 2 - full automation of an irrevocable delivery versus payment (DvP) electronic system for settlement of market transactions in all securities. The 5yr project completed within budget and won the 1996 Australian Information Industry Association award for excellence through information technology. SEATS97 - enabled stockbrokers to plug into their own dealing systems, automate the flow of orders and trade confirmations to and from their clients, allows access internationally as well as across Australia. Closing Single Price Auction (CSPA) introduced. Mechanism facilitates the market close each afternoon. CLICK, the new automated options trading system for ASX's derivatives market commences. Corporations Law Amendment (ASX) Bill passed enabling ASX's demutualisation and listing becomes effective. ASX demutualised and become a listed company. It was the first exchange in the world to demutualise and list on its own market, a trend that has been imitated by several other exchanges over the years. The Australian Mutual Provident Society began in 1849 as an organisation offering life insurance. Now known as AMP it became a publicly listed company on the ASX in 1998, the busiest day in ASX history at the time in terms of total value traded - in excess of $6.5b in one day. SFE closed its trading floor and started 24-hour screen trading. New and substantially improved derivatives clearing system implemented, with options and futures clearing capability in multiple currencies. Open interface (OI) of SEATS used to provide investors with automated access to the equities market, via their brokers, for the first time. SFE became the first exchange (futures or stocks) in the Asia Pacific to be granted permission by the Commodities Futures Trading Commission to set-up trading terminals in the US. SFE underwent a corporate restructure and implemented a holding company structure under SFE Corporation Limited. SFE admitted to the official list of ASX. Launched derivatives education program in partnership with Securities Institute of Australia. ASX began trading ASX Contracts for Difference (CFDs) in November 2007. CFDs on offer covered major foreign exchange pairs, the S&P/ASX 200 index, the Dow Jones Industrial Average and gold. Additional equity, index and commodity CFDs were launched shortly after. ASX ceased offering CFDs as of June 2014. Transfer of supervisory responsibility for real-time trading activity and participant conduct on licensed financial markets to ASIC. ASX Market Supervision changed its name to ASX Compliance to reflect the change in the regulatory environment. The Australian Securities Exchange launched a new brand structure when it became known as ASX Group. ASX Group was developed to better reflect the role of ASX Limited as a group holding company with a range of activities linked by their common strategy: to provide the market infrastructure necessary for a globally competitive capital market and a vibrant Australian economy. The Australian Liquidity Centre (ALC) opens February 3. The ALC will house ASX's core trade execution and post trade platforms along with other financial market participant and service provider technology. ASX Collateral service is launched. May 2015 saw the introduction of mFund, a new way to access unlisted managed funds. mFund allows investors to buy, hold and sell units in unlisted managed funds through a process similar to buying and selling shares. The ALC Customer Service Centre is officially opened in April. In January ASX announces US-based firm Digital Asset Holdings, LLC (DAH) is appointed to develop solutions for the Australian market utilising Distributed Ledger Technology (DLT). T+2 settlement of sharemarket trades was commenced. ASX extends depository services to renminbi-denominated securities. ASX increases investment in Digital Asset Holdings LLC (DAH), June 2016. Weekly and serial equity options begin trading. ASX appointed as new Bank Bill Swap Rate (BBSW) administrator.